2 15th & 16th Streets Lehigh Av. - 15th St. [back: 16th St.] - Pollock St.
8 Norris & Susquehanna Fairmount Park - Dauphin St. [back: Susquehanna Av. - 21st St. - York St.] - Susquehanna Av. - Susquehanna Av. [back: Norris St.] - Delaware Av. 9 Strawberry - 4th & 5th Ritner St. - 5th St. [back: 4th. St.] - Arch St. - 23rd St. [back: 22nd St.] - 29th St. - Columbia Av. - 31st St. [back: 32nd St.] - York St.
17 South 19th & 20th Front St. - Market St. (surface) - 19th St. N. [back: 20th St. N.] - Johnston St.
18 South 22nd & 23th Front St. - Market St. (surface) - 22nd St. [back: 23rd St.] - Snyder Av. 20 12th & 13th Philadelphia Navy Yard - 10th St. - 13th St. [back: 12th St.] - Old York Rd. - Erie Av. 21 North 17th & 18th Front St. - Market St. (surface) - 18th St. N. [back: 17th St. N.] - 17th St. N. - Pulaski Av. 25 Cedar - Memphis 4th St. - Girard Av. - [Norris St. - Cedar St.] [back: Memphis St. - Susquehanna Av.] - Lehigh Av. 29 Morris & Tasker 28th St. - Morris St. [back: Tasker St.] - Front St.
31 Market - 63rd - Subway City Hall - Market St. (subway) - Market St. (surface) - 63rd St. - Haverford Av. - Landsdowne Av. 32 South 17th & 18th Front St. - Market St. (surface) - 17th St. S. [back: 18th St. N.] - Shunk St.
33 North 22nd Front St. - Arch St. - 20th St. [back: 19th St.] - Ridge Av. - 21st St. [back: 22nd St.] - 22nd St. - Hunting Park Av. 38A 52nd St. Extension Fairmount Park - Parkside Av. - 52nd St. - Landsdown Av. 39 Dauphin & Susquehanna Fairmount Park - Dauphin St. [back: Susquehanna Av. - 21st St. - York St.] - Front St. - Kensington Av. - Cumberland St. [back: Huntingdon St.] - Richmond St.
42 W Spruce St. Front St. - Walnut St. [back: Chestnut St.] - Woodland Av. [back: Spruce St. - 33rd St.] - Spruce St. - 61st St.
46 58th & 60th Sts. Woodland Av. - 58th St. - Baltimore Av. - 60th St. - Landsdowne Av. 47 Godfrey - 8th & 9th Wolf St. - [9th St. - 7th St. - 5th St.] [back: 6th St. - Franklin St. - 8th. St.] - 5th St. - Godfrey Av. 52 Chelten - Midvale East Falls (Ridge Av.) - Midvale Av. - Wayne Av. - Chelten Av. - Old York Rd. 54 Lehigh Av, Ridge Av. - Lehigh Av. - Kensington Av. - Somerset St. - Richmond St.
56 Erie - Torresdale Hunting Park Av. - Erie Av. - Torresdale Av. - Cottman Av. 57 Jefferson & Master 29th St. - Jefferson St. [back: Master St.] - Front St. [back: 2nd St.] - 2nd St. - Erie Av. 61 Manayunk Walnut St. - 9th St. [back: 8th St.] - Ridge Av. - Manayunk (Main St.) - Leverington Av. 63 Catharine & Bainbridge Front St. - Catharine St. [back: Bainbridge St.] - Schuylkill Av. 64 Federal & Wharton Sts Front St. - [Federal St. - Ellsworth St.] [back: Wharton St.] - 34th St.
65 York Rd. - 6th & 7th Oregon Av. - 7th St. [back: 6th St.] - Old York Rd. - Olney Av. 75 Wyoming Av. 17th St. - Erie Av. - 5th St. - Wyoming Av. - [Arrott St. - Margaret St.] [back: Orthodox St.] - Richmond St.
78 Lansdowne Darby - Wycombe Av. - Fairview Av. 79 Snyder Av. Swanson St. - Snyder Av. - 29th St. Note: Route designations for the Fairmount Park system are for convenience only, and were not used by the operator. BS Broad Street Line Olney Av. - Erie Stn. - North Phildelphia Stn. - Girard Stn. - City Hall - Snyder Stn. RA Ridge Av. Spur Line Girard Stn. - Ridge Av. - 8th St. & Market St. Note that the subway route abbraviations BS, MF, RA and BL are for convenience only, and were not used by the operators. Note that the suburban route abbraviations N, S, A, M, SH and WC are for convenience only, and were not used by the operators. Light rail lines: ? km. MunicipalsStreetcars: (horse-powered) 26 March 1856 - ca. 1900; (electric) 1 Jan. 1889 - today. 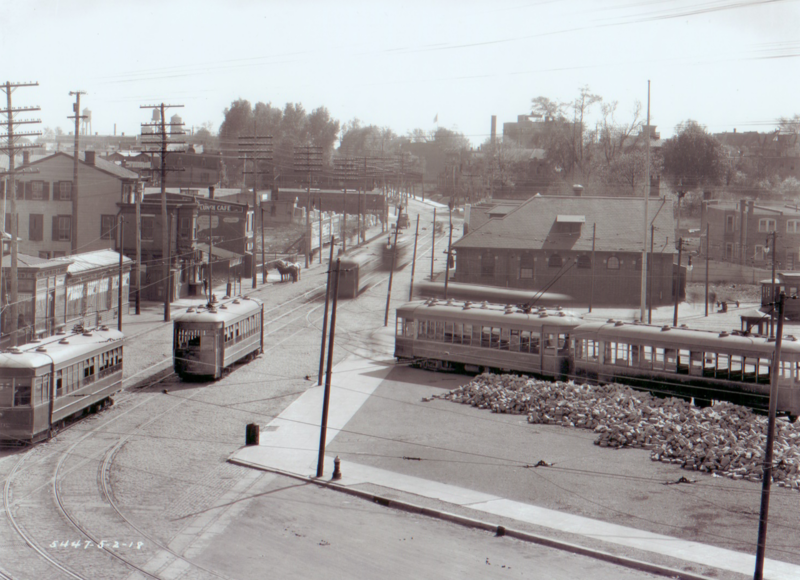 Fairmount Park Transportation Co. streetcars: 10 Nov. 1896 - 9 Sept. 1946. Cable cars: 7 Apr. 1883 - 19 June 1895. Light rail (Philadelphia and Western Railroad (P&W)), to Stafford & Norristown): 22 May 1907 - today. Light rail (Phil. 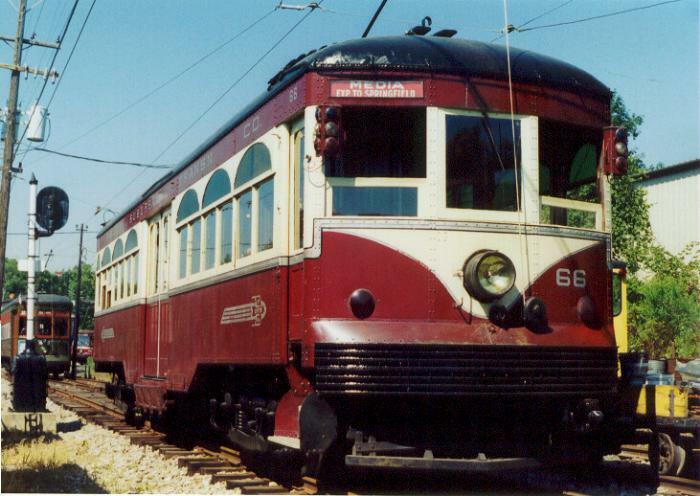 & West Chester Traction Company; later Philadelphia Suburban Transportation Company (PST)): 1895 - 1896; (electric): 1896 - today. Subway: 4 March 1907 - today. 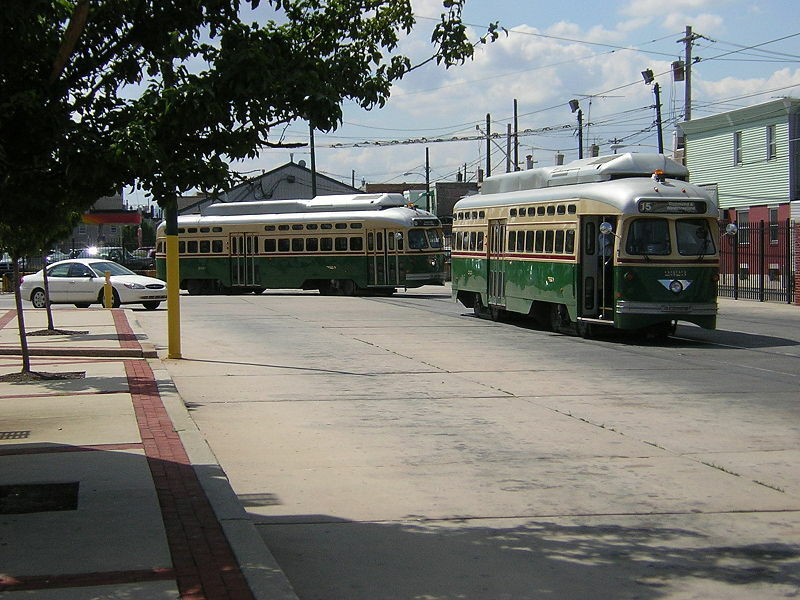 Streetcars (including Fairmount Park Transportation Co.): 1588 mm. Light rail (except Norristown line): 1588 mm. 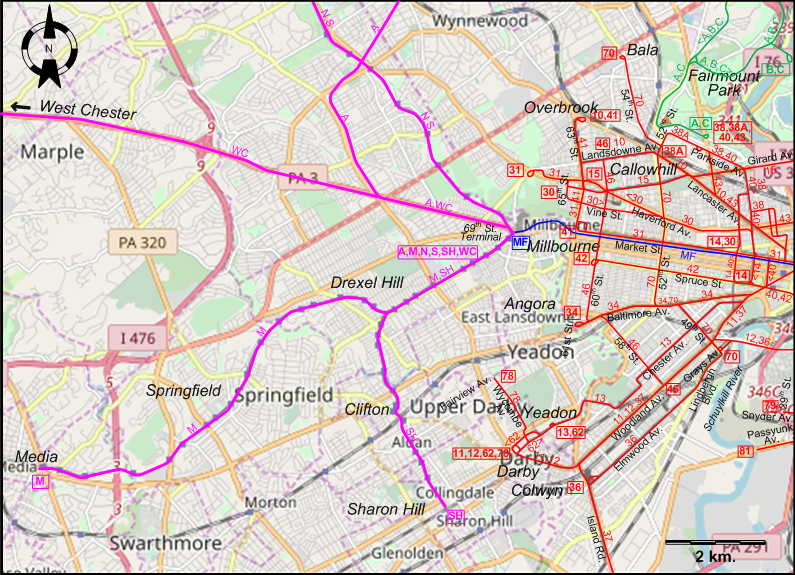 Other rapid transit (including Norristown high-speed line): 1435 mm. Cox, H.E. 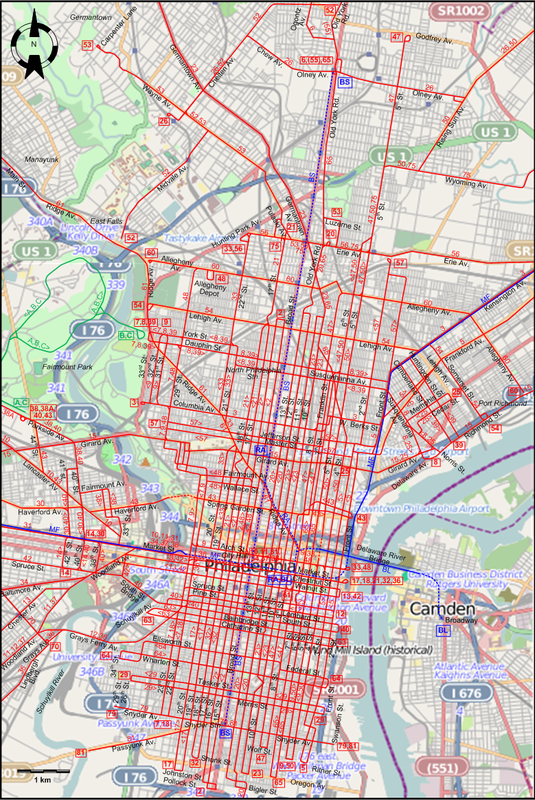 Philadelphia car routes. Self-published, 1962. Cox, H.E. "The tram subways of Philadelphia [Map]" Modern Tramway & Light Railway Review, June 1963 (26: 306), p.205-214. Cox, H.E. "The tram subways of Philadelphia - A history and a forward look" Modern Tramway & Light Railway Review, Jan. 1964 (27: 313), p.24. DeGraw, R. "Pig and Whistle: The story of the Philadelphia & Western Ry" Central Electric Railfans' Association Bulletin 2007 (#140). DeGraw, R. The Red Arrow. Newtown Square (PA): Haverford Press, 1972. Demery, L.W. "US transit funding - Part 6: Elsewhere in the USA (East Coast) [Boston]" Modern Tramway & Light Rail Transit, July 1990 (53: 631), p.225-226. Gillham, J. Philadelphia Suburban Transportation map #118. Self-published, 1952. Jackson, R.E., Walker, P.J. & Wyse, W.J. 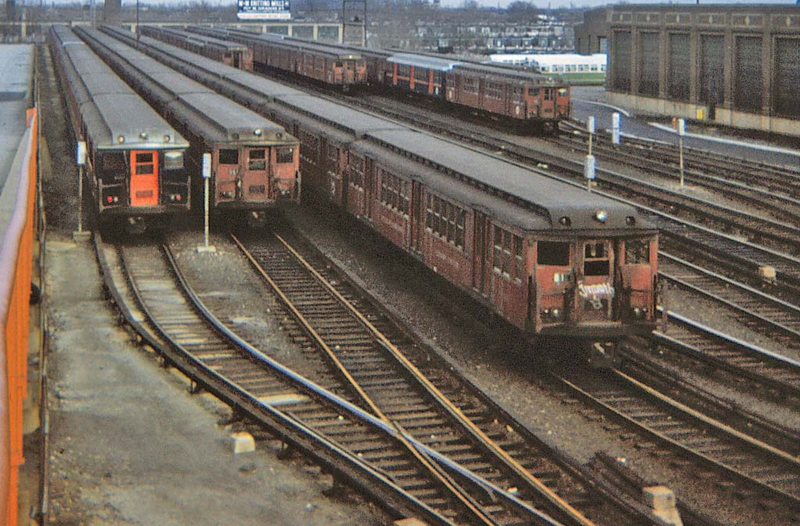 "The Lyndenwold Rapid" Modern Tramway & Light Railway Review, July 1970 (33: 391), p.228-236. Jenkins, M. "Philadelphia's route 23" Modern Tramway & Light Rail Transit, Aug. 1987 (50: 596), p. 255-262. 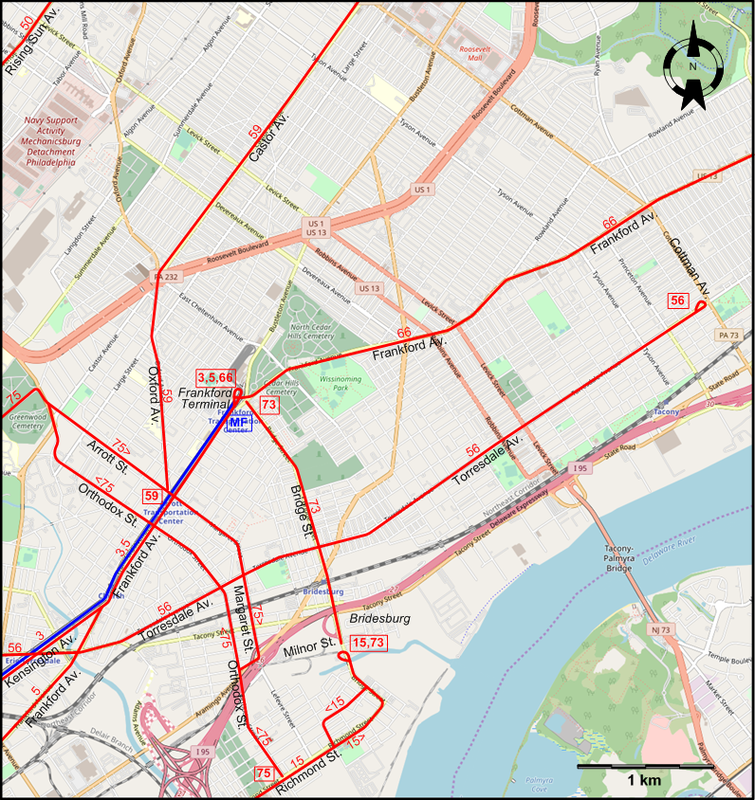 PTC Map of Philadelphia showing street car, bus and subway-elevated lines. Philadelphia: Philadelphia Transportation Company, 1940. Skelsey, G. "A street car named Endure: Rail transit in Philadelphia - Part 1: The city and its character" Tramways & Urban Transit, Jan. 2006 (69: 817), p.10-15. Skelsey, G. "A street car named Endure: Rail transit in Philadelphia - Part 2: Heavy rail and SEPTA" Tramways & Urban Transit, Feb. 2006 (69: 818), p.53-55. 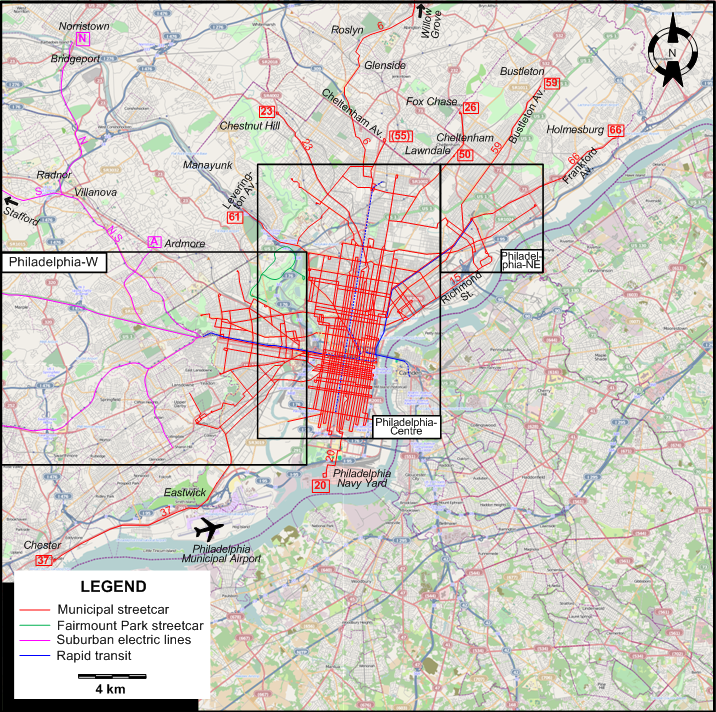 Skelsey, G. "A street car named Endure: Rail transit in Philadelphia - Part 3: Rail transit in Philadelphia" Tramways & Urban Transit, March 2006 (69: 819), p.94-97. Special thanks to Russell Powers from Denver CO for information on the history of the Philadelphia system.